I wouldn't have chosen another career for myself; makeup artistry really combines skill, creativity, a certain amount of science and a requirement for emotional intelligence... But like anything, you really need to work hard to get anywhere. Education has and always will be the lifeblood of my brand, both for its ability to empower and inspire. My passion lies in making sure both aspiring makeup artists and my customers have access to the right techniques, and tools (literally and figuratively) to succeed in today's competitive market. As a self taught makeup artist, I have experienced the ups and downs of the ever-changing beauty industry, which is why I created my very own Makeup Academy -- to educate, prepare and inspire the next generation of creatives. It may seem like all you need to become a working artist is a well stocked kit and some makeup know-how, but that assumption can be the first step to failure. Here are a few tips I like to share with my academy students across the globe to help them jump start their careers. There's never a dull day when you work as a freelancer because you never know who's going to end up in your makeup chair! I've met and worked with women from all walks of life, and it's my responsibility as the artist to read their social queues, adjust my attitude and make them feel comfortable interacting with me. After all, doing someone's makeup is a physical, intimate experience and I always want my clients to feel safe and confident in my hands. I ALWAYS suggest starting in retail, the shop floor is where you learn those valuable people skills, selling skills (because at the end of the day, you're selling yourself!) and you get to practice your makeup and application skills. A good makeup artist knows what's happening right now, but a great makeup artist knows what will happen next. Not only do you need to be all over what's happening in the industry, but you need to know the trends AND be the trendsetter. After all, your clients are a lot more likely to pick up the phone and make that next appointment if they know you'll be clueing them into the latest looks and helping them find the hottest new brands and products. Even better, they'll be more inclined to talk positively about you, and that's something money just can't buy. 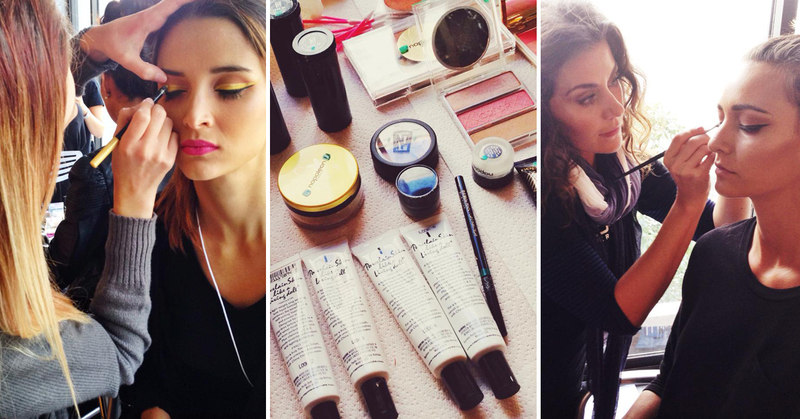 How do you ensure you're up to date on all the latest makeup innovations and hot new trends? Set aside an hour or two a day to browse your favorite websites, mags and blogs for the most recent beauty and fashion news. If you have the budget to travel, major cosmetic conferences are another great way to explore what's next in the world of makeup. As a makeup artist, you are your own brand. As the founder, president, CEO, head of creative and sole employee, it is up to YOU to market yourself and promote your work. Begin with an online portfolio. Upload a few photos you are proud of and continue to add and change images as your skills evolve. Keeping your portfolio up to date with fresh imagery demonstrates that you are active, engaged, and in demand. Embrace social media! Facebook, Twitter, Instagram and YouTube play a huge part in helping you build your business. Allow future clients the opportunity to contact you with questions and feedback. Customers these days want and expect instant access, and the sooner you embrace the digital world, the faster you can acquire more work. I wouldn't have chosen another career for myself; makeup artistry really combines skill, creativity, a certain amount of science and a requirement for emotional intelligence... But like anything, you really need to work hard to get anywhere. My biggest tip? Believe in yourself, plan, and then go for it. Everything is possible!